The U.S., Europe and Japan have been using sanctions to punish Russia for its role in destabilizing parts of Ukraine. 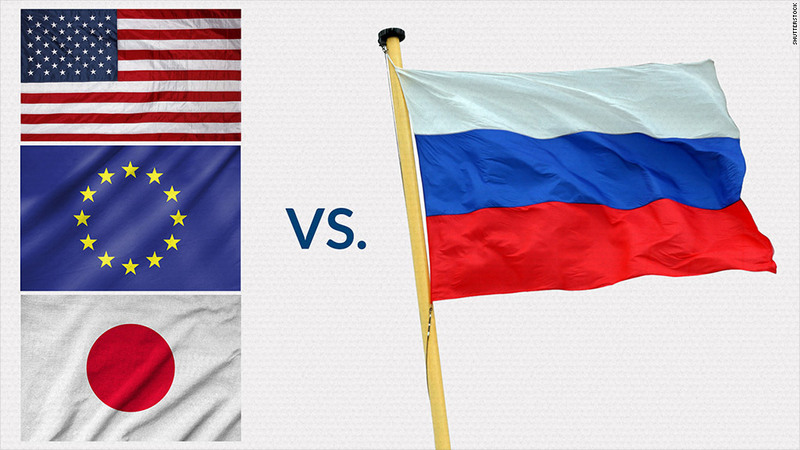 European leaders are trying to hit Russia where it hurts. They're issuing new, tougher sanctions targeting eight of Russian President Vladimir Putin's "cronies" and taking a swipe at Russia's finance, energy and weapons industries. The names of the "cronies" and three sanctioned entities will be released Wednesday. The sanctions are part of a coordinated effort by Western nations to punish Russia for its role in annexing Ukraine's Crimea region and supporting pro-Russian rebels in Eastern Ukraine. The U.S., which is less dependent on Russia for trade, has taken the lead on doling out comparatively tougher sanctions. Talk of sanctions has become more urgent since the commercial flight MH17 crashed in Eastern Ukraine. U.S. and Ukrainian officials say a Russian-made missile system was used to shoot down MH17 from rebel territory. Russia and the rebels have disputed the allegations and blamed Ukraine for the crash. The U.S. issued even more on Tuesday, hitting three major financial institutions including the Russia's fifth largest bank, the Bank of Moscow, as well as the Russian Agricultural Bank, and VTB Bank. Various international companies have been hurting as sanctions have intensified. On Tuesday, shares in British oil giant BP (BP) fell by 2.5% after the company warned that it would suffer from tougher sanctions. BP owns a significant stake in Rosneft, Russia's biggest oil company, which has been the target of U.S. sanctions -- the company can no longer access long-term financing from American sources. Shares in French automotive manufacturer Renault (RNSDF) slumped by 4.5% Tuesday as the company warned about a sharp slowdown in emerging markets, including Russia. Russia is Renault's third largest market based on sales. Russia's $2 trillion economy slowed dramatically this year as cash flowed out of the country in response to the threat of tough financial sanctions. Russia's main stock market index has declined by 9% since the start of the year and the ruble has plunged. The country's central bank hiked interest rates last week for the third time since March. The government hopes that higher rates will make it more attractive for businesses to keep money in Russia. However, it also means that both consumers and companies will have to pay more to borrow money. It also raises the risk that the economy will sink further into recession.